Oil prices rip higher, rebounding sharply on OPEC production cuts and U.S.-China trade talks. Saudi Energy Minister reaffirms that the kingdom's oil production and exports will fall in coming months. Crude futures briefly pared morning gains after data showed a big jump in U.S. fuel stockpiles. Oil prices ripped higher on Wednesday, rebounding from a pullback on bearish U.S. stockpile data after Saudi Arabia reassured the market that its oil production and exports are falling sharply. The oil market also drew support from talks between the United States and China aimed at preventing an all-out trade war. The market fears the dispute between the world's two biggest economies could slow global growth and weigh on fuel demand. U.S. West Texas Intermediate crude surged 5 percent to a nearly one-month high at $52.58 in late morning trade. The contract ended Wednesday's session up $2.58, or 5.2 percent, to $52.36. International benchmark Brent crude was up $2.55, or 4.3 percent, at $61.27 around 2:25 p.m. ET, after earlier rising as high as $61.58. After tumbling more than 40 percent over nearly three months, oil prices have risen by about 17 percent during an eight-day rally. Saudi Energy Minister Khalid al-Falih on Wednesday said the kingdom will meet its goal of reducing output to 10.2 million barrels per day this month. That is down about 900,000 bpd from record Saudi output in November. Saudi Arabia will export 7.2 million bpd in January and 7.1 million bpd in February, according to Falih. The comments offer further evidence that OPEC and its oil market allies, including Russia, are cutting production following an oil price collapse late last year. Led by Saudi Arabia, the producers have vowed to keep 1.2 million bpd off the market starting this month. Falih said he believes the production cuts will balance the market, but won't rule out taking further action if supply starts to outstrip demand again. "The market's just really responded to some of the early evidence that they are cutting back," said John Kilduff, founding partner at energy hedge fund Again Capital. That is contributing to a macro rebound against the backdrop of a rising stock market and the U.S.-China trade talks, said Kilduff. U.S. and Chinese trade representatives extended talks scheduled for Monday and Tuesday into a third day, as the two sides reportedly made progress towards resolving their long-running trade dispute. The two sides have yet to reach a breakthrough that will prevent the United States from ratcheting up tariffs on billions of dollars in Chinese goods, a move that would force Beijing to retaliate. 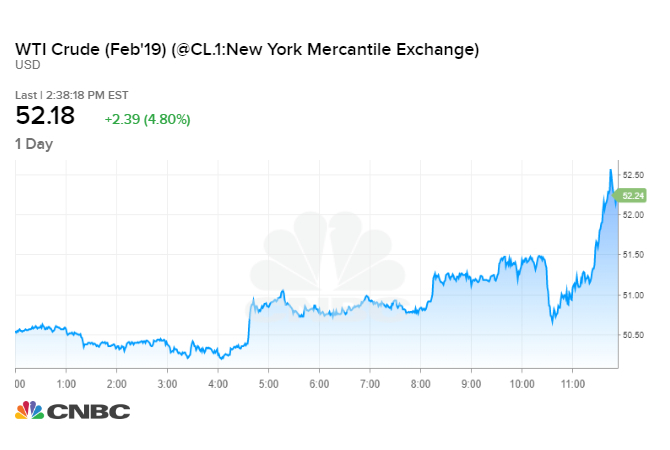 Crude futures briefly pared gains after the U.S. Energy Information Administration reported a big surge in fuel stockpiles. The nation's inventories of gasoline rose by 8.1 million barrels, while its stockpiles of distillates, which include diesel and heating fuel, jumped by 10.6 million barrels. Meanwhile, crude oil stockpiles fell by 1.7 million barrels, EIA reported. Tom Kloza, global head of energy analysis at Oil Price Information Service, says the Saudi rhetoric was enough to offset the stockpiles data and push oil prices past some key levels. "On a day when we were close to some technical breakout numbers, we're riding the technical wave higher," he said.